Prior to the growing efforts for knowledge, predicting, and enhancing college students' learning in instructional settings, learning analytics emerges as a candidate studies region to address such problems. Hence, several studies have been conducted; in addition, numerous conceptual and theoretical perspectives have been arisen. Moreover, quite exciting and beneficial results have been produced all through the learning analytics brief life time. However, a clean concept of numerous questions is still pending (e.g., What does getting to know analytics suggest? What are its backgrounds, related domain names, and underlying factors? Which can be the devices of its applications? and What about the developments and demanding situations to be taken into consideration?). 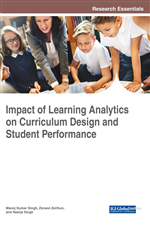 That is why the chapter explains the learning analytics background, nature, including new and applicable methods, and a relation of risks and possibilities. Although analytics have arrived later to schooling than to authorities (Siemens 2014), analytics has ventured to help educational labor. That is why specialized lines have emerged, given that the ones which are appropriate for chancellors of educational establishments, at the same time as others concentrate on the learning process, in addition to the personal learner.